Santa Barbara Plaza has been whitewashed, boarded up, security gates padlocked. Most of the 240 small and large shops once here have been relocated, were bought out or have gone out of business. The vacant lots and decaying storefronts have long been sore points for the residents who live near the corner of Crenshaw and Martin Luther King Jr. boulevards. Attempts to rejuvenate the complex known by many as Marlton Square have been a complicated failure spanning more than two decades. The reasons are plenty: litigation, backstabbing, unstable developers and perhaps even the naiveté of the Los Angeles City Council. A ray of hope seemed to have broken the clouds once again in 2010. After years of silence on the project, the L.A. Community Redevelopment Agency issued a request for qualifications (RFQ), a step in the process of finding a developer. But hopeful applicants may be in for a disappointment; the job they are applying for does not yet exist. and angry constituents. Litigation has been continuous since April 2006, when the bank responsible for lending the cash to buy up the rest of the Marlton Square parcels - USA Capital - went bankrupt. Two years later, the developer followed suit. According to 8th District Councilman Bernard Parks, it could be years before the city sees any movement in the direction of progress at Marlton Square. negotiating with the new ownership, little can be done. Beginning the search for qualified developers is a way of scouting talent in the mean time, but the job comes with no set start date. With the Baldwin Hills Crenshaw Plaza mall across the street, Marlton Square seems a prime location for redevelopment. The mall owners have just begun a $30 million upgrade at the same intersection where the blighted Crenshaw Discount Swap Meet in Santa Barbara Plaza has sat vacant for years. Decades of neglect have rendered the area an embarrassment in contrast to the community around it, hip Baldwin Hills, artsy Leimert Park and swanky View Park. But the complex conundrum of Marlton Square is a difficult one to solve,even for a company like Capri Capital Partners, owners of the Crenshaw mall. company bought the Crenshaw Plaza mall for $136 million in 2006. The past is strewn with moments of hope for Marlton Square, quickly followed by disappointment. Star power brought the project into the spotlight throughout the late 1990s and early 2000s. Basketball-star-turned-developer Magic Johnson won the exclusive right to negotiate in 1996, only to lose the deal to football star Keyshawn Johnson. “Our time had run out,” said Lombard, who partnered with the Magic Johnson Development Corp. before taking over the Baldwin Hills-Crenshaw Plaza. Lombard said the lack of cooperation from the 40-plus owners of Santa Barbara Plaza dissuaded his team from taking on the project. Unable to obtain control of the parcels, the Johnson-Lombard team suffered a major setback when Walmart pulled out. Meanwhile, the CRA moved on as well. Capital Vision Equities, owned by Chris Hammond, had important allies on the Los Angeles City Council, including Mark Ridley-Thomas. The two had met in 1988 when Hammond was campaign manager for Jesse Jackson’s presidential bid. Ridley-Thomas introduced Hammond to USC and NFL football star Keyshawn Johnson, who invested around $500,000 in Hammond’s successful Chesterfield Square project. The $53 million project featured a Home Depot, grocery store and more just a few miles from Santa Barbara Plaza. The two teamed up once again to tackle Marlton Square, and with the endorsement of Ridley-Thomas, the deal was made in January 2001. Hammond as the developer, he had contributed $2,000 to soon-to-be Mayor James Hahn, with another $2,000 in 2001. Hammond also contributed $1,500 to Mark Ridley-Thomas between 1998 and 1999, and $5,000 to Rocky Delgadillo for city attorney. Hammond’s wife, Ayahlushim Hammond, who worked for the CRA at the time of his introduction to the project, contributed $3,000 for Hahn’s mayoral campaign between 1998 and 2001 and $1,500 to Ridley-Thomas. across the city, including campaign contributions. His loans went into default, and despite spending millions of dollars, Hammond failed to secure enough property to see the project through. City Controller Laura Chick criticized the CRA for failing to run thorough background checks on Hammond, his partners, and Capital Vision Equities. By then Hammond was already deep into borrowing money, buying up properties and even building. The one sign of progress that exists today - four-story Buckingham Place senior center - was an utter failure from inception. There were supposed to be three buildings with 180 beds. Only one stands, has 70 beds, and is uninhabitable. The U.S. Department of Housing and Urban Development last year found the city failed to have a competitive bidding process or scrutinize Hammond’s financial equity. The audit accused L.A. officials of failing to responsibly oversee the development of Buckingham Place. It only took a month for the city to respond and agree to ensure compliance to federal rules and improve administration. The federal government had given $8.5 million to the city - which “lacked written procedures and had insufficient monitoring controls in place for projects.” The city, in turn, gave the money to Hammond. And if the city doesn’t finish Buckingham Place by 2012 the feds want the money back. As the pink and green senior complex rose, Hammond borrowed millions from private lenders. 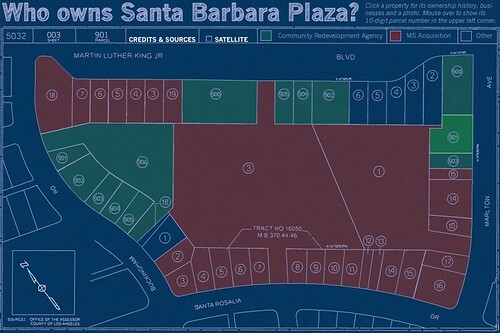 By 2006, Hammond’s had secured about 25 properties- about half of Santa Barbara Plaza. But Hammond was stringing everyone along those five years, creating an intricate financial knot that the city cannot untie. The knot became Gordian when Hammond’s bank went bankrupt itself in 2006. Hammond had taken a $36 million loan from the Las Vegas-based USA Capital to buy the parcels, all the while soliciting cash from multiple investors. When USA Capital dissolved, it made history as the largest company in the state of Nevada to go into bankruptcy, leaving a mess comprising $962 million in assets and more than 6,000 investors. Convicted of fraud, former owner Joseph Milanowski was sentenced to 12 years in prison in April this year and ordered to pay $86.9 million in restitution. The deeds to the parcels are trapped under the name of MS Acquisition Company LLC, a venture created by Hammond and his retail business partner Jeff Lee, owner of the Lee Group Inc and Lee Homes in Marina Del Rey. Documents show that there are 300 investors tied to the MS Acquisition loan. The battle over which creditors control which assets continues. Marlton Square is not the priority. According to Parks, the city only lost around $7 million by investing in Hammond, only because of safeguards within the contract, created with a sense of mistrust, the councilman Parks said. “In my judgment there was little confidence in him the way (the city) wound the deal so tight. They were adamant you cannot get a dime of city money until you accomplish this." The city would invest $7 million until Hammond could secure 80 percent of the Marlton Square property. A further $40 million was at the ready, but Hammond never got his hands on it as he defaulted on the project in 2004. Though the city hedged its bet and “only” lost $7 million, the decision to go with Hammond cost the neighborhood 10 extra years of living amid the crumbling ruins that attract crime and repel opportunity. Councilman Parks said that although the lack of progress can be disheartening, his mode of operation has been to think “long term” by buying as much land as the CRA can afford, and stockpiling for a time when the nearly bankrupt city has more money to invest in redevelopment. For residents hoping to see change, a ghost town covered in graffiti will remain the status quo. Living within sight of the eyesore incites anger and disappointment, and after decades, indifference in many. Chris Hammond could not be reached for comment. He represented himself in bankruptcy court and a lawyer representing Chris Hammond could not be found. Jeff Lee, Hammond’s partner in the residential part of Marlton Square, did not respond to requests for interviews. On the business index for Hammond's Capital Vision Equities, LLC, Minnie Talton is listed with the California Secretary of State's office as agent for service process. The company’s status is suspended. Talton said she left the company in 2006 and was surprised to find she was listed as the person who would get a subpoena for the company in the event of lawsuit. She wouldn't talk about the company. As to Chris Hammond's whereabouts, she repeated what others have said. "I haven't talked to him in years; I don't know how long," Talton said. "I don't know where he is. Sorry." This crowdfunded, crowdsourced piece of investigative journalism was funded through Spot.Us. Below is a link to an article that sums up my views about what should be done with Marlton Square (Santa Barbara Plaza) in light of today's economic malaise and the shift in consumer purchasing patterns through the use of technology. Ironically, Frederick Olmstead designed New York's Central Park, and Olmstead Ave in Leimert Park is named after him. As an owner/developer myself, due to the collapse of the real estate financial markets and reduced demand for housing, I am "land banking" a large "entitled" parcel of land in Oklahoma City as a "greenfield" until economic conditions improve. Currently the "highest and best" use of the parcels that make up Marlton Square (Santa Barbara Plaza) is not the current state that they are in today. This article provides an "unconventional" way of looking at development going forward, especially for an urban area but I think it deserves some discussion. It has been 22+ years since the first redevelopment of the Baldwin Hills-Crenshaw Shopping Center and it is on it's second go round. At this rate it may be another 20 plus years before anything of significance toward improving surrounding property values and the quality of life will be done with the blighted 27 acres that are contributing to the downward pressure on our surrounding residential properties. LA Councilman Bernard Parks declared in his newsletter that this is "THE REAL STORY OF HOW MARLTON SQUARE WAS MISHANDLED." Marlon and Eddie thanks so much for this information. I will hope to attend the next Neighborhood Council Meeting and also the talk tomorrow night. It sounds like Crenshaw Neighborhoods, Inc. has done some amazing work in the area. DAVID CARSON AREA 2 REP.
JOHNNIE RAINES III AT-LARGE REP.
LARK GALLOWAY AREA 3 REP.
REV. JAMES LEE WALKER AREA 3 REP.
@Susan. Crenshaw Neighbors Inc. is a community based organization that was created in 1964 to facilitate the smooth integration of the local neighborhoods during a time of significant demographic transition. Throughout the years the organization was active in addressing issues that were important to maintaining a high level quality of life in the community. It was instrumental in the creation of the APEX program which today the magnet school programs are modeled after. They were also active in neighborhood beautification efforts and sponsored tours of some of the historically beautiful homes in Windsor Hills and View Park. It was a very active organization in the 1960s, 70s and 80s but through attrition over the years has lost many members and today exists primarily with a handful of members dedicated to keeping the spirit of CN alive. There is a neighborhood council but I am not sure what the current status is. The CAC is the Citizens Advisory Committee to the CRA. It is the appointed liaison between the Community Redevelopment Agency (CRA) and the public at large. I just moved to the area and learning the history of this development is very enlightening and frustrating. I couldn't figure out how it could be in the middle of such beautiful places. Marlon Dorsey mentions Crenshaw Neighborhood, Inc. do they have regular meetings that could be a way to start organizing what he and Sapphire talk about? Or, are there neighborhood Councils here? I've kind of looked online, but can't quite figure out how representation works here. Also, I'm sorry if I missed this, but could someone explain what is the CAC? Thanks so much. "WE THE PEOPLE", can be stronger than most think, and we the people can help to move this project along if more would get involved. Your idea of investing in the project is excellent and could be a win win for all concerned if handled properly. Also, Chris Hammond is gone. No need to continue to even think you will get anything from him or his company at this point. Who was responsible in giving him the deal and how it was worked is to no avail at this time. It is a done deal, and we need to move on. We have attorneys living right in the community that could lend their support to research and gather information on exactly where everything stands (with the properties/ownership/litigations) at this time.We have community members with professional experience and skills to help in various ways. We can all buy into the project. We can form a company (none paid ) with involved community members and major stakeholders to move this project along. We can hire an accounting firm to handle the monies donated/given towards the project. We can look at proposals, and analyze other information. We can do something! Also, do no let the current City Council member off the hook! He represents the 8th district. The CRA will allow this matter to linger on for decades if there is no SCREAMING from the community! The CAC (although good intentions) seem not to have any influence in the matter, and I agree that the same discussions was mulled over for many years with no solid movement. We the people, can do something. We the people should be outraged about this situation, and we the people should be doing any and everything we can to bring attention to this matter via the press and other media outlets mentioned in the piece. The project can bring beauty, commerce and other benefits to the community. We need dedicated people who are willing to donate their time and skills towards positive movement.